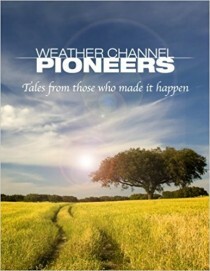 Willis Eschenbach found an interesting article on weather-related deaths. Objectives - This report examines heat-related mortality, cold-related mortality, and other weather-related mortality during 2006-2010 among subgroups of U.S. residents. Methods - Weather-related death rates for demographic and area-based subgroups were computed using death certificate information. Adjusted odds ratios for weather-related deaths among subgroups were estimated using logistic regression. He writes: Here’s their money graph. It shows the number of deaths by the age of the person dying. Here was the story Allan and I wrote in 2015 on a Lancet study of mortality. Warmists and their compliant media reporters continue to stress the danger of heat and ignore cold in their papers and in stories. The danger associated with this misdirection is that cold weather kills 20 times as many people as hot weather, according to an international study analyzing over 74 million deaths in 384 locations across 13 countries. The findings were published in The Lancet. “It’s often assumed that extreme weather causes the majority of deaths, with most previous research focusing on the effects of extreme heat waves,” says lead author Dr Antonio Gasparrini from the London School of Hygiene & Tropical Medicine in the UK. The study analyzed over 74 million (74,225,200) deaths between 1985 and 2012 in 13 countries with a wide range of climates, from cold to subtropical. Data on daily average temperature, death rates, and confounding variables (eg, humidity and air pollution) were used to calculate the temperature of minimum mortality (the optimal temperature), and to quantify total deaths due to non-optimal ambient temperature in each location. The UK Guardian looked at Excess Winter Mortality after the 2012/13 hard winter. They used data from the ONS. Each year since 1950, the UK Office for National Statistics or ONS has looked at excess winter mortality. The ONS take an average of deaths in winter (those in December to March) and subtract the average of non-winter deaths (April to July of the current year and August to November of the previous year). The result is considered ‘excess’. Like other European countries, more people die in the UK in winter than in summer. Some 58% of winter excess deaths were women, a trend that has been quite consistent over the past three years. Circulatory diseases were cited as the biggest cause of winter deaths (accounting for 37%), closely followed by respiratory diseases (32%). Unsurprisingly, the majority of deaths occur with older people - specifically those aged 75 and above. See paper on UK Excess WInter Mortality here. “The impact of cold weather on health is predictable and mostly preventable. Direct effects of winter weather include an increase in incidence of: heart attack; stroke; respiratory disease; flu; falls and injuries; hypothermia. Indirect effects of cold include mental health illnesses such as depression, and carbon monoxide poisoning from poorly maintained or poorly ventilated boilers, cooking and heating appliances and heating.” Department of Health (2012) Cold Weather Plan for England. In normal milder western and southern Europe, the Excess Winter Mortality is greater than in the colder northern climates, where people are more accustomed to colder winters and homes are built to keep the residents warmer (better insulated, central heating). Also energy costs there are far higher thanks to the early adoption of the inefficient and much more expensive renewable energy. The UK reported 50,000 excess deaths in the UK in 2012/13. Excess Winter Mortality was 31,100 in England and Wales in up 29% from the previous year. Figures for Scotland showed a much smaller increase in winter deaths, up 4.1% to 19,908. In Northern Ireland meanwhile, the raw numbers were low but the increase was large, a rise of 12.7% to 559 deaths. 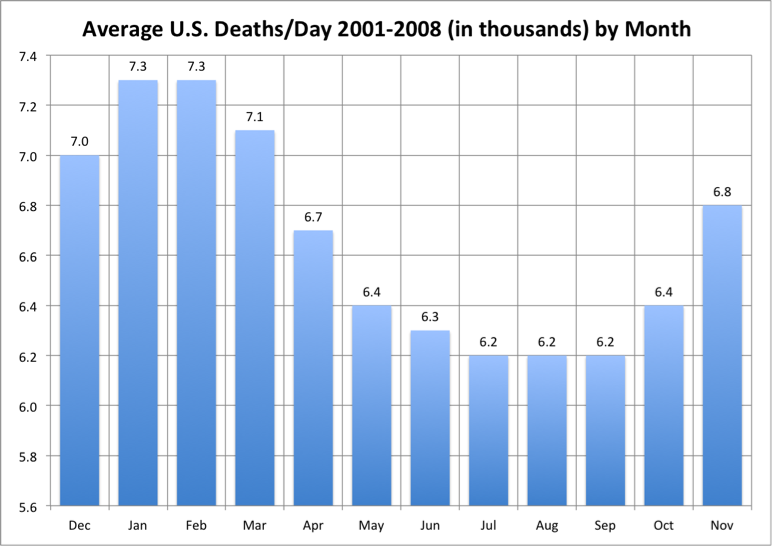 Similarly, the USA death rate in January and February is more than 1000 deaths per day greater than in July and August. Despite claims that extreme heat in increasing and cold decreasing, the data says the un-manipulated state extreme temperature data shows the opposite. 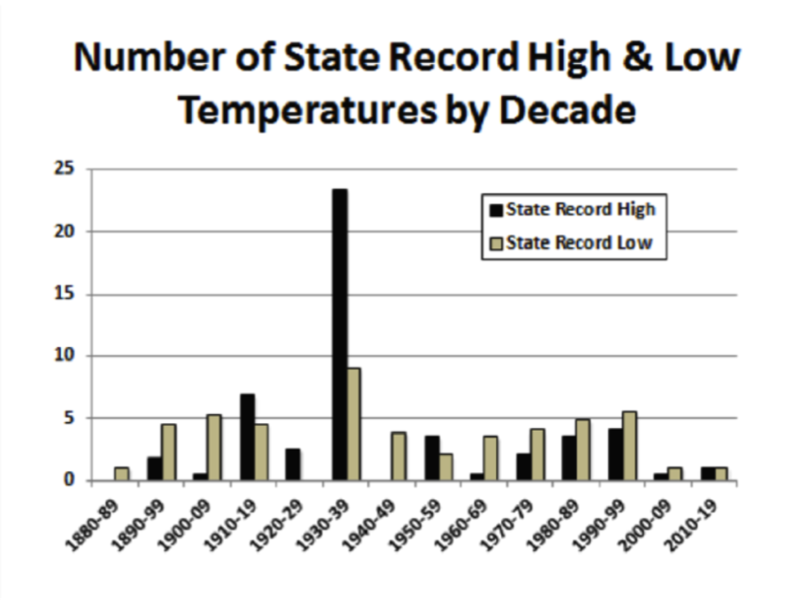 23 of the state all-time record highs occurred in the 1930s and 38 before 1960. 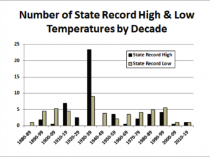 There have been more record lows since the 1940s than record highs. Statistics Canada also reports deaths by month. 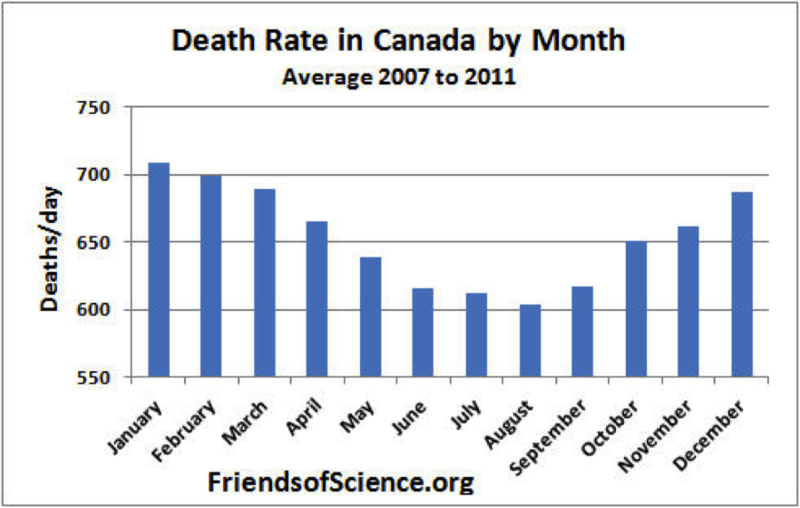 The graph below shows the deaths per day for each month in Canada averaged over the years 2007 - 2011. 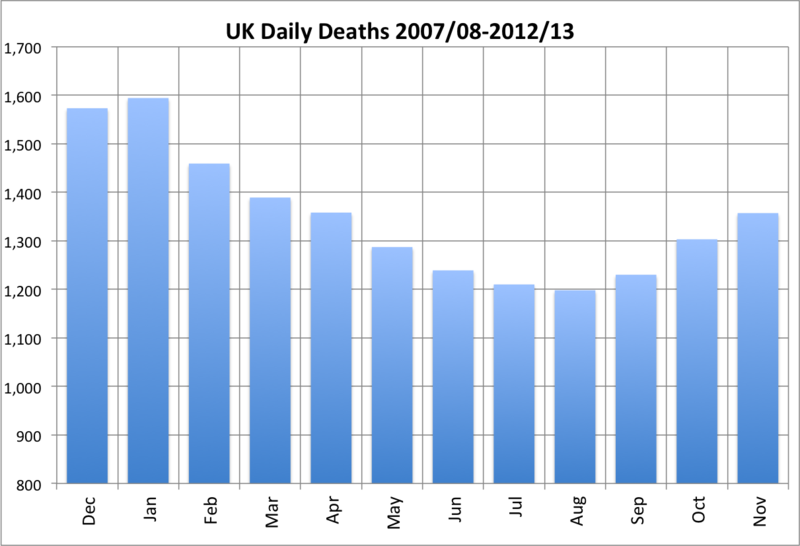 The graph shows that the death rate in January is more than 100 deaths/day greater than in August. See more here. Even down under in Australia we see the same story. Queensland University of Technology found (Source Science Daily) Australians are more likely to die during unseasonably cold winters than hotter than average summers. Professor Barnett said the finding that hotter or more humid summers had no effect on mortality was “surprising.” “We know that heat waves kill people in the short-term, but our study did not find any link between hotter summers and higher deaths,” he said. There’s something that befudles economists and the administration about the U.S. economy in the first three months of every year: It frequently grows at a much slower pace than in the other nine months. The below academic paper, authored by the Federal Reserve Of Chicago, validates the growing link between advancing cold and its impact on economies. From slowing money velocity to low bond yields and reduced consumer spending, behavioral economics are well documented here and offer implicit confirmation that not only is the planet not warming but that cold weather is partially responsible for the slow economic recovery following the 2008 economic crisis. As the Federal Reserve grapples with interest rate policy, the credibility of U.S. dollar may be at stake. Investors worldwide evaluate it’s health with the U.S. treasury market a proxy, roiled recently by a sequence of Federal Reserve revised Gross National Product numbers. We ask this question: were initial strong first quarter GDP numbers during the past several years skewed by faulty reporting of mild winter weather, then later adjusted lower by the impact of under reported cold weather? The implications of such divergences are enormous to world markets. Alec Phillips, an economist at Goldman Sachs, noticed that from 2010 through 2014, growth in the first three months of the year has averaged 0.6 percent, while it has averaged 2.9 percent in the other three quarters. And Macroeconomic Advisers, a forecasting firm, has found that the pattern goes back further: Since 1995, outside of recessions, the first quarter has grown at half the pace of the other three. See the new Federal Reserve study on the effect of cold on the economy here. See also here how BofA and some FED divisions had scoffed at cold weather impacts but are seriously lobbying to have government adjust GDP numbers to come better in line with their bad forecasts.